Pitchers learn and develop different pitches, and they do so at varying stages of their lives. It might be a curveball in high school, a cutter in college, or a changeup in A-ball. Sometimes the addition or refinement is a natural progression — graduating from Pitching 101 to advanced course work — and often it’s a matter of necessity. In order to get hitters out as the quality of competition improves, a pitcher needs to optimize his repertoire. In this installment of the series, we’ll hear from three pitchers — Tony Barnette, Ryne Stanek, and Nick Tropeano — on how they learned and developed their split-finger fastballs. “A lot of guys in Japan throw a split, so they got me on that. I started playing with different grips, and found one that worked for me. 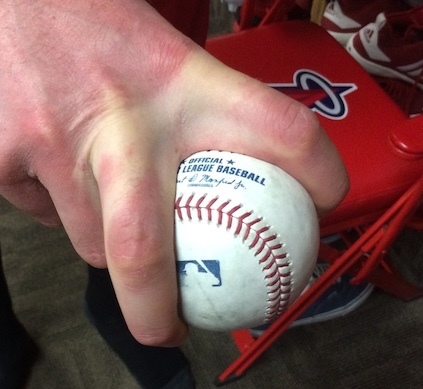 If you look at a baseball, the seams are crazy. They go all over. Basically, you split your fingers and find seams. You find seams that fit your hand. Then, one day you have that ‘aha’ moment where it’s ‘Oh my god, this works.’ From there, you working on it more. “I picked up my split playing catch with my catching partner in Triple-A, Steve Geltz. This was during my first stint there. My changeup wasn’t very good, so I was like, ‘Show me how to throw your split.’ I’d never tried throwing one before. “I started messing around with one. So, Geltz was kind of like the dude who showed me how to throw it. He was letting me throw the split to him as I was trying to figure it out, and it got to be pretty decent. “My splitter is something I developed when I was in the Cape Cod League, when I was a sophomore in college. James McCann, who is with the White Sox now, was catching me at the time. “I used to throw a one-seam fastball. We were messing around, and McCann said, ‘Hey, why don’t you spread out your fingers a little bit on the seams and see what happens?’ You know what? I threw one pitch and it fell off the table. That’s basically how my splitter came to be — how I discovered it — although it obviously took a lot more perfecting after that. The 2018 installments of this series can be found here. We hoped you liked reading Tony Barnette, Ryne Stanek, and Nick Tropeano on Developing Their Splitters by David Laurila! David Laurila grew up in Michigan's Upper Peninsula and now writes about baseball from his home in Cambridge, Mass. He authored the Prospectus Q&A series at Baseball Prospectus from December 2006-May 2011 before being claimed off waivers by FanGraphs. He can be followed on Twitter @DavidLaurilaQA. The pain of the splitter grip photos, the pain. After throwing that for twenty years what do a guy’s fingers look like, do they have a permanent gap?